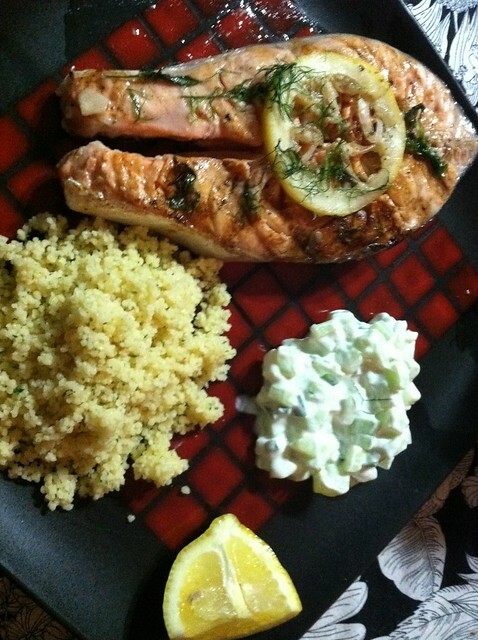 salmon and tzatziki dinner – ugly food tastes better. So i knew immediately what i wanted to do with my CSA dill and cucumbers. Tzatziki, Greek cucumber sauce, is one of my all time favorite condiments, as are all of its cousins, like Indian raita, etc. It is just so cool and refreshing and goes on everything from bread to fish to chicken to veggie curry. Like everything else, I make a ton so i can eat it all week while making a mess only once. I hate cleaning. 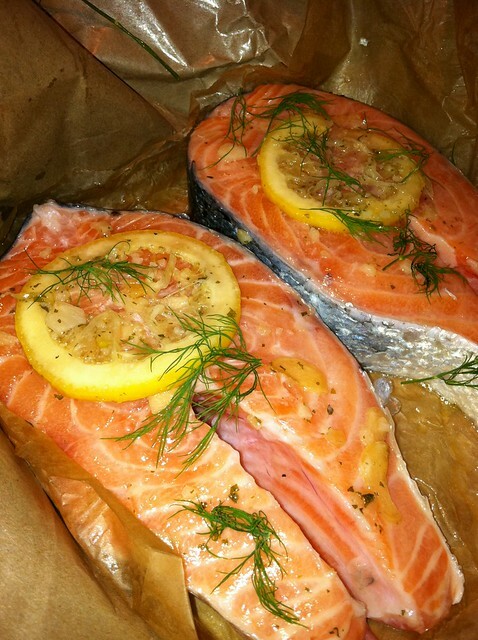 Nutrition – high in fat, but healthy, fishy fats that your body needs. Step 1 – So i have this little spritzer bottle of olive oil that I like to use when i only want a little but i want it to go a long way, i highly recommend it. Go ahead and spritz your salmon steaks with oil and rub with garlic and dill, squeeze your lemon end over both sides and then place your rings on top. Step 2 – Throw those babies on the grill (or foreman or grill pan or whatever youve got) for 10-12 minutes, depending on size, flipping halfway through and transferring your lemon rings. Now put your starch on (i made garlic couscous) and start making your tzatziki. 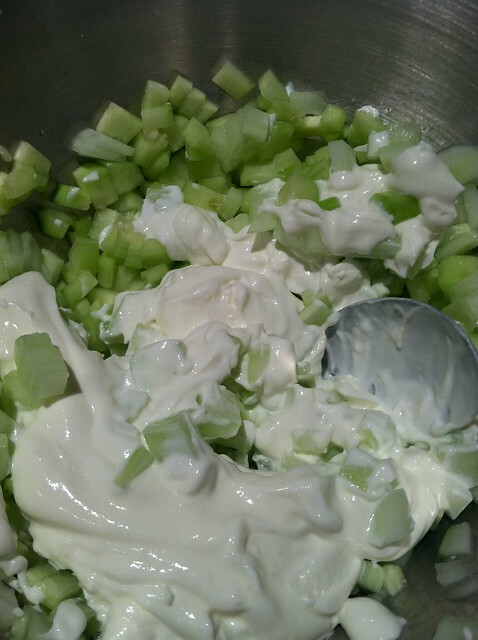 Step 3 – mix all tzatziki ingredients with the exception of the lemon, which should be squeezed over it. Season to taste. Here you can either leave it as is, or you can put it in a food processor if you want more of a sauce. (this is more for gyros, etc) I left mine chunky. Plate and serve. Nom. Pingback: grilled salmon with mashed sweet potatoes and collards | ugly food tastes better.